Jump to 1:45 seconds once video begins.....enjoy! Rising markets have two very negative and interconnected effects. First, a rising market facilitates unrealistic hopes and high expectations about future stock returns. Second, a rising stock market actually lowers the future expected returns. This is because (to some extent) these recent returns are the result of expectations of future growth which drives up prices. Therefore, higher prices today reflect borrowing of returns from the future. Yet what do people do when markets rise? Investors buy; and that act of buying results in locking in poor future returns. In other words when markets rise, "curb your enthusiasm", and when they fall, "do the opposite" of what everyone else is doing and buy! The most comfortable investment advice will always be short-term oriented. "Go to cash". "Get out now, until things look better". "Everyone is making money....I better get in now". Uncomfortable advice (which is the opposite of what you want to do) is typically long-term oriented, yet best for your financial future. "Emerging markets have been hammered and are on sale". "I better take some profit by rebalancing my portfolio". Warrren Buffett has used an analogy of two business partners where one is highly emotional and the other is unemotional. The business' chief competitor is always trying to buy their business for the fair price of $10/share. When the partners' business gets a huge order from Walmart, the emotional partner wants to buy out the unemotional partner for $15/share. Then, when the order gets cut the next week, he fears he will lose everything and is willing to sell for $5/share. If the unemotional partner remains calm, he simply waits for the emotional partner to become fearful so he can buy his shares for $5 each, then sells them to him for $15 each when he becomes euphoric. This is what contrarian investors do. They do the opposite of the emotional partner. They simply sit back and wait for the market to price stocks for less than they are worth (in the long run) so that they can buy and lock in higher future returns. In other words, instead of following your emotional instincts, which are wrong,do the opposite! While our instincts are there to help us in time of danger (such as an attack by a lion), our instincts betray us when it comes to investing. Let's take a look at what our instincts can do to our future returns. Future stock returns are driven in large part by the prices at which you buy today. If you buy when prices are emotionally high (think tech bubble), you are locking in poor 10-year future returns. If you buy when prices are emotionally low (think the financial crisis), you are likely locking in good 10-year future returns. Investing is not about winning today, this month, or this year. Investing is about earning the LONG-TERM returns you deserve given the risk you have taken. When markets are cheap, they give us great future returns. But the only way to capture these returns is by doing the opposite of your instincts. If you followed your instincts and invested at the peak of the tech bubble (in the S&P 500), your 10-year returns were -3% annualized. If you followed your instincts and bailed out of stocks in the midst of the 2008 financial crisis, you would have missed out on to-date annualized returns of 13.83%. We know that investors' instincts are wrong because studies show they move into top performing funds/markets after most of the good returns have been realized. These investors then bail out of the funds/markets after most of the losses have been incurred. These studies generally find that investors earn 30%-50% less than the investments themselves due to bad instinctive behavior. The problem is that you have to have the guts to do the opposite. 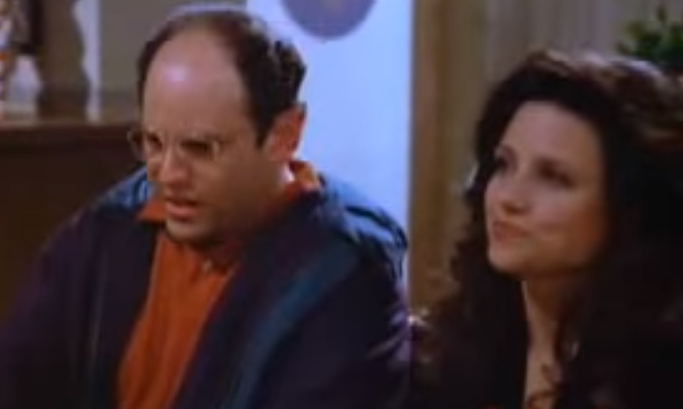 In the video, think of how George Costanza drummed up the nerve to approach the attractive woman in the coffee shop. He had the guts to do the opposite and it paid off! If it feels like a good and comfortable time to buy stocks, you are going to pay a premium, and will likely get poor long-term returns. When things are unpleasant in the world and people are scared, then markets are priced to give you very good future returns. Do you have the guts to do the opposite, buying when others (and you) are fearful and selling when others (and you) are euphoric? As Jerry famously said, "If every instinct you have is wrong...then doing the opposite must be right!"